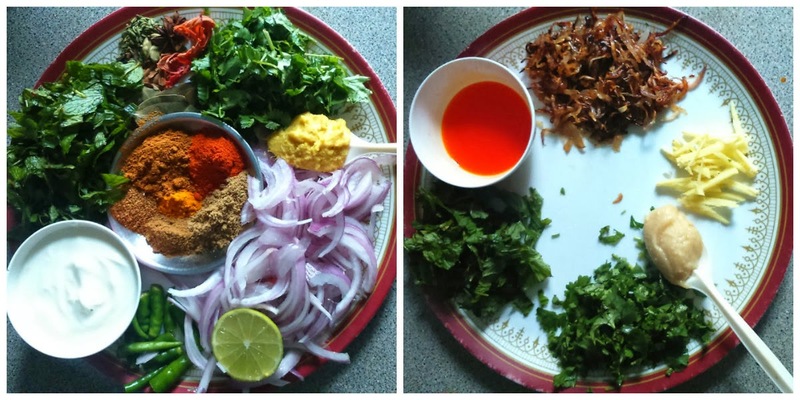 Pavi's Platter: Chicken Pakhi Dum Biriyani ! Chicken Pakhi Dum Biriyani is a type of dum biriyani where the chicken is cooked fully and then layered with almost cooked basmati rice and kept on dum. Unlike the kachi dum biriyani where raw marinated chicken is layered wiith partialy cooked rice hereboth rice and chicken are cooked and can be layered in more than one layer depending on the amount of biriyani cooked. In a heavy bottomed vessel / stock pot add oil and once hot add the whole garam masala spices and saute for few seconds. Then add sliced onions and saute until they turn translucent. Then add ginger garlic paste and saute for another minute. Throw in the washed chicken pieces and saute them along with the onions. Make sure the pieces are big for biriyani. After sauting the chicken for 5 minutes, add the green chilli pieces followed by chopped mint and coriander leaves. Mix them well and then add the finely chopped tomatoes. Close and cook for 4 - 5 minutes. And then add all spice powders and mix them well so that the chicken pieces are coated with the masala well. Add salt as needed and Squeeze in the lemon juice. Add little water and close the vessel and let the chicken pieces cook. Meanwhile in a big vessel take lots of water and once it comes to a boil add the whole garam masalas. Add curd to the chicken and let it cook for another 3 -5 miinutes. Meanwhile add the soaked basmati rice to the boiling water and let it cook. you can see two pots on stove one in which chicken is getting cooked and another one where rice is getting cooked simultaneously. Check if the chiken is cooked well and turn off stove. THere should not be much water left. It should be like semi gravy. Keep an eye on the rice as well as it gets cooked very fast (5 mins). Once rice is 90% cooked turn off stove and drain the water immediately. Now its time to layer.. Remove half of the chiken gravy in to a separate bowl and spread the remainig half in the pot. Now spread half of the rice on the chicken as shown. Spread the remaining chicken on this. Now spread the remaining rice and again repeat the samething. Spread the brown onions, ginger, mint and ghee. Sprinkle the orange food color. And if any gravy is left out pour it on the rice. Drizzle the rose water and kewra water and finally add a tbsp of ghee. Close the lid tightly with a cloth inside to prevent the steam from escaping. Place the vessel on the stove and keep the flame to the minimum possible. In gas burners if you are not able to control the flame to minimum then place an iron tawa on the stove and keep this biriyani vessel on it and leave it for 30 minutes on dum. Traditionally atta dough is kept on the vessel and closed tightly but i would prefer closing with a cloth instead of wasting atta. I found your link on Epicurean Delight and tried it out. Biryani tasted excellent, thanks for the great recipe!